Eating out in Delhi is a truly special experience and unlike many other cities throughout the world, Delhi has a lot more to offer the average punter than just a handful of 'high class restaurants'. Of course Delhi has ample first class venues all eager and able to provide you with luxurious dining experience, but on this page I am hoping to do a little more than list already well known restaurants. This of course means delving into the infamous Delhi street food scene - the scene that has put off travellers to the capital for decades due to the ingrained fear of the dreaded Delhi belly. Another central topic of this page is the Thali restaurants which are so definitive of food in India where for as little as 50 cents you can get an all-you-can-eat meal of your dreams! A large part of eating out in Delhi comes in the form of the Indian street food is a way of life for the Indians who inhabit Delhi. This street food as it is known for us is called 'chaat' and 90% of the time consist of some savoury type of deep fried speciality. Sampling this local treats is a fantastic way of discovering some of the spices and flavours which make Indian food so unique. The classic roadside snack, Pani Puri are deepfried, hollow balls served with some sort of spicy selection of potatoes and sometimes onion. 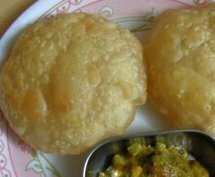 The dish is very popular when eating out in Delhi is also known as Gol Gappa which relates to the fact that the crispy ball (Gol) is shoved in your mouth in one go and with out biting (Gappa). This fairly basic dish is basically a type of potato patty but this time covered in light flour and fried. They are usually come accompanied with onion and some beetroot or bean-sprouts depending on what was available at the time! 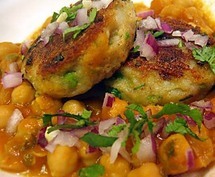 Mashed potato is the main ingredient of this type of Indian street food which is usually garnished with a side of deep fried Masala and a West Indian chickpea curry curry. Absolutely delicious if you ever have the chance. Note: "The McAloo tikki burger is a trademark of McDonald's served at McDonalds restaurants in India, is not a true representation of the traditional food." Of course there are a thousand different types of street food in India and then again a million different variations of each dish depending where you go. Other things to keep your eyes out for (in my opinion) are: Poori-Subzie(or Bhaajee), Chai-faen, Vada pav, Bhelpuri and finally if you're really lucky then the Masala Dosa which although common in South India can be found in Delhi and is well worth a try if you get a chance! And the place to go? well it may not be such a stupid question.. well I mean it is found on the street of course and you'll likely find at least 3 vendors on every street corner of the city but without a doubt the best for eating out in Delhi is Chandni Chowk. Here, at least compared with other parts of the city, there is a slightly deeper understanding of the word 'hygiene' meaning your odds of picking up a bug are greatly diminished. The reason is likely the fact that it is a more touristy area so they have had to 'adapt'. This section is about the cheap restaurants in Delhi for those of you who care about the quality of the food you eat and also care about the slowly diminishing bulge in your left pocket (wallet). The definition of 'cheap' is something that is debatable in India.. Cheap could mean a million different things depending on your social background, appetite and dietary requirements. The restaurants and food mentioned in this section of the page range in value from those suitable for backpackers to those suitable for slightly wealthier families or couples who may care a little more about the premises in which they consume amazing food. The truly Indian themed restaurant is the first of >>>>> restaurants in this list located on the region of Pahaji. You can get incredibly high quality and tasty food in this joint for anything between 70 - 200 Rupees ($1 - $5). Follow the link for a Map of the restaurant. This cool little hang out is very popular amongst travellers and backpackers and is famous for it's tasty but incredibly cheap food - not much is above $4 and if you ask they'll bring you some beer although it's likely it will come in a teapot (as a disguise). Steak and chips is a classic here along with some Italian food. Follow the link for the address and Map of the restaurant. "Delhi-ites swear by Saravana`s south-Indian"
"Great food that is the bottom line"
"Not at all expensive, but really good food"
And what might you expect to eat? 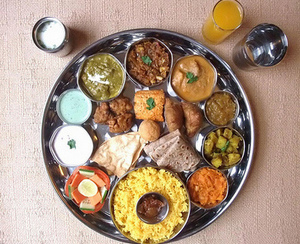 One of the classic meals that you might find when eating out in Delhi is the Thali - A sort of all you can eat meal consisting of any number of different dishes which are regularly topped up while you eat. The photo to the left kind of says it all although this kind of dish can come in almost a million different variations, in the south you'll usually find a similar meal but you'll be eating of a leaf..